RYAN ROBINSON LOVES YOUR FACE: How NOT to start a weekend . . . 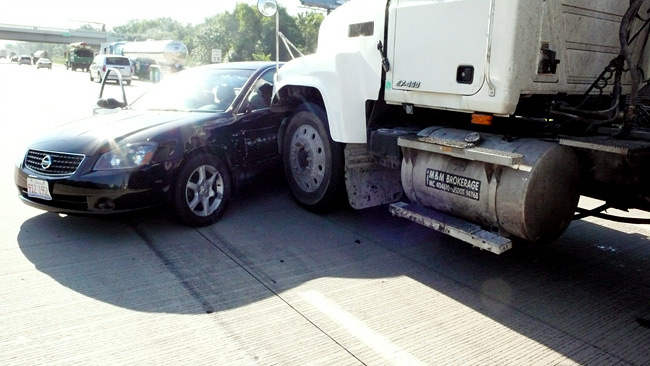 So, this is what happens when a semi-truck sideswipes you at 70mph and you end up getting pushed sideways for 1/4 mile. We're all okay and made it to my cousin Nina's wedding on time, just not in this car. Please wear your seatbelt and be safe - there's a ton of crazy, careless drivers out there. The ones that are driving with 18 wheels need to be a bit more aware of their surroundings.